Return to Home > Testosteron-Boosters/ tribulus>OLIMP - T-100 LTD Edition 120 cap. OLIMP - T-100 LTD Edition 120 cap. It's time for one of the strongest testosterone boosters which until now was composed. The limited edition of the well-known to T-100® is about to launch on the market. 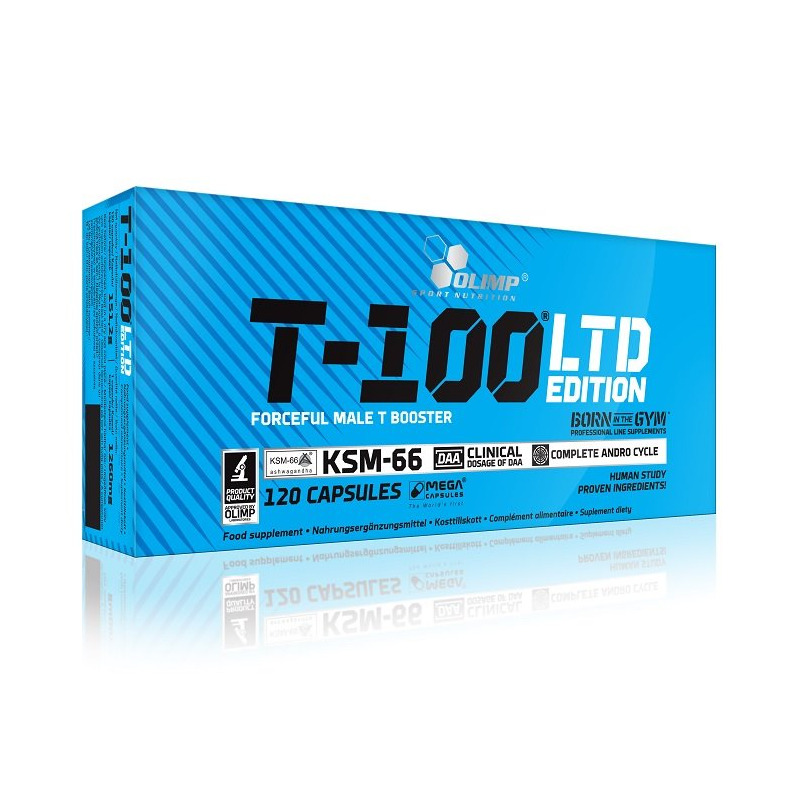 T-100® LTD EDITION signed with the logo of Olympus Sport Nutrition® starts a whole new era of multi-component products dedicated to people who want to achieve the most optimal hormonal profile of the body to improve exercise capacity and quality of life. Test it by giving a completely different dimension to your workouts and everyday life. The mechanism of T-100®, LTD EDITION based not only on the increasing testosterone production, but its maximum elevation of the free form in the blood, by simultaneously reducing the conversion of metabolites of the undesirable range of operation. The underlying assumption when designing the T-100® LTD EDITION was the synergy of all the active ingredients. Basis for T-100®, LTD EDITION is based on the assumption of maximum increase in circulating free testosterone and its structural molecules which are agonists, acting in a manner similar to that of androgen. 59.7% D-aspartic acid, bulking agent - microcrystalline cellulose; magnesium salts of citric acid, 4.5% ashwagandy patented extract (Withania somnifera L.) KSM-66 extract, black cumin (Nigella sativa L.) seed extract, pumpkin (Cucurbita pepo L.), anti-caking agents - magnesium salts of fatty fatty silicon dioxide; Bisglycinate 0.9% zinc (zinc amino acid chelate Albion ®), 0.03% pyridoxine hydrochloride - vit. B6 capsule (envelope components - gelatin, dye E 171). Consume 1 capsule 4 times a day during meals, drinking plenty of water. Do not exceed recommended servings for consumption during the day. Food supplements should not be used as a substitute for a varied diet. A balanced diet and healthy lifestyle. Note: Not recommended for children, pregnant women, breastfeeding or in case of hypersensitivity to any component of the formulation.